In a way, Saint Francis employees live out the legacy of our founding sisters every day. We’ve enshrined it in our renewed mission, which now graces the Medical Center’s main entrance: to provide a mission of healing, wellness, quality and love inspired by our faith in Jesus Christ. But the sisters’ legacy also lives on in the memories of the patients they served. With that in mind, there’s someone you should meet – his name is Dave. Maryann Reese: When was the last time someone surprised you? Coincidences can make us feel like part of something bigger. They make us feel closer to the people around us. And sometimes they surprise us by reminding us just how far a little kindness can go. Welcome to the first episode of our new podcast, A Second Opinion, with me, Maryann Reese. Last Friday, we unveiled our renewed mission statement. Many of you were there and even those who were not may have noticed the big oak lettering across the main entrance. If not, you should check it out. It’s pretty impressive. Our renewed mission is to provide a ministry of healing, wellness, quality and love inspired by our faith in Jesus Christ. And that mission statement is like a compass: a quick point of reference to keep us headed in the right direction as we move forward. In a similar vein, we have also put up photos from the archives of our sisters going about their daily work.Now, all those reminders are important because in every encounter, there’s an opportunity to live out our mission. And as you’ll hear in a little bit, behind every picture, there’s a story. Those of you who attended already know that we had an especially distinguished guest list. We had the excellent Pinhook Singers Choir, Sister Jane Kiefer, as well as a number of other guests. Even Bishop Rice came to join us. Bishop Rice: This hospital is anchored in the faith and the dedication of the sisters and the laypeople who worked here. MAR: And the theme of the day, which the bishop addressed, was how in renewing our mission, we at Saint Francis are paying tribute to the example of our founding sisters. BR: We stand on the shoulders of those who have come before us. In a sense, they did all the hared work. We inherited it and we have the obligation to continue it. MAR: While he praised our new mission –which he helped us to develop– he also cautioned us against complacency. BR: A mission statement is crucial but there can be a disadvantage to a mission statement and I want to address that. The danger is that after having put so much time into the new mission statement, what do you do? You frame it, you put it on a wall, and you forget about it. That cannot happen, huh? It’s your responsibility to drive the mission. Make it known. Make it real. 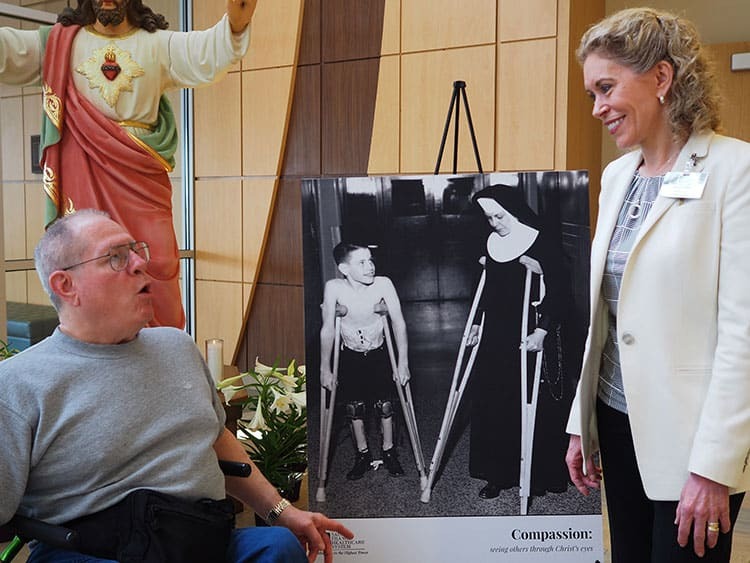 Let it permeate every inch of this institution from the boardroom to the basement, so that everyone knows that Saint Francis Medical Center is inspired by our faith in Jesus Christ. 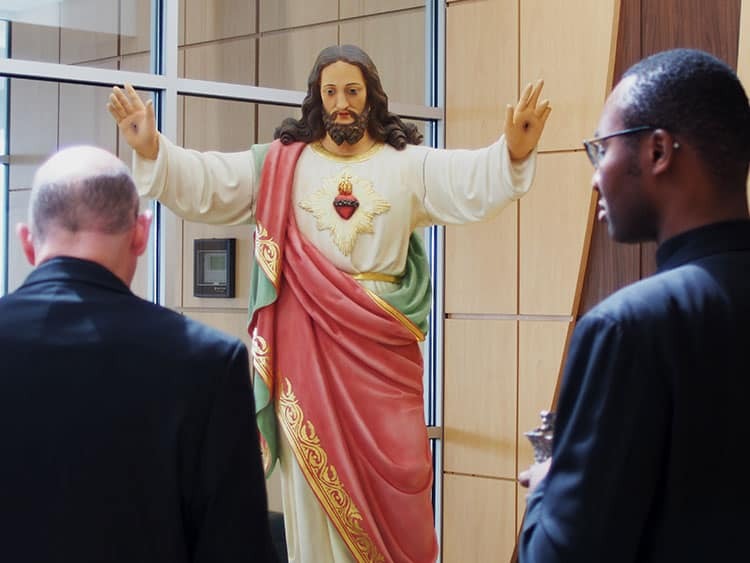 MAR: And luckily, as the bishop pointed out, our new sculpture of the sacred heart of Jesus in the lobby is an excellent reminder. BR: That statue is a very concrete symbol of what should go on here at this hospital campus. The challenge is to allow Him to use our words to convey his comfort. And when that happens, well, get out of the way and let Jesus do his work. MAR: Before Bishop rice blessed our statue, he shared his own personal connection. BR: As a side note, as I was reading over the notes for the program last night, as it was mentioned that statue is almost 150 years old. It comes from St. Bridget of Erin Church which, it just happens to be, this is just how God works, my mom was baptized at that church. In north St. Louis on North Jefferson, I know exactly where the church is. It was just taken down about a year or two ago, but my mom was baptized at St. Bridget’s Church in north St. Louis. And that’s the statue she would have looked at many years ago. MAR: But as it turns out, there was an even more surprising coincidence sitting in the crowd at our celebration. His name was Dave, and I’ll let him take it from here. Dave Faris: Okay, My name is Dave Faris. Born and raised in Cape Girardeau, born in 1947. Lived here most of my life except when I was away at school to become a watchmaker and I lived in Perryville for about 10 years. 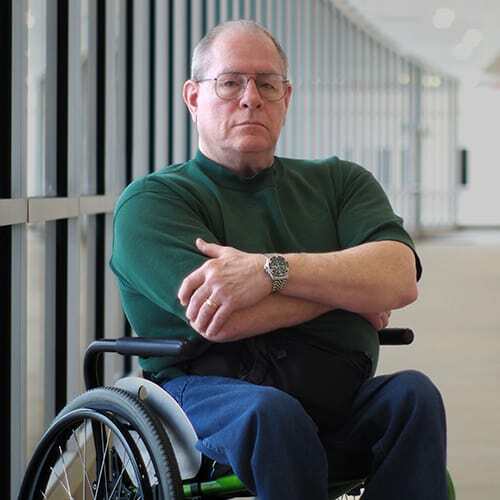 Finally made it back home, went to work for Procter & Gamble until I had to go out on long-term disability in the early 90s. But I’m married, living in Cape, 70 years old now. It was Friday afternoon, I believe, and I had gone to Wal-Mart to buy some tea for my wife, as well as a few other small grocery items and my sister-in-law had been passing by the chapel about a week before that and said she looked in the display case at all the old memorabilia and she said there’s a picture of me and a nun. So I came out of Wal-Mart, had some spare time, and I thought I’d just stop by and look at the picture. 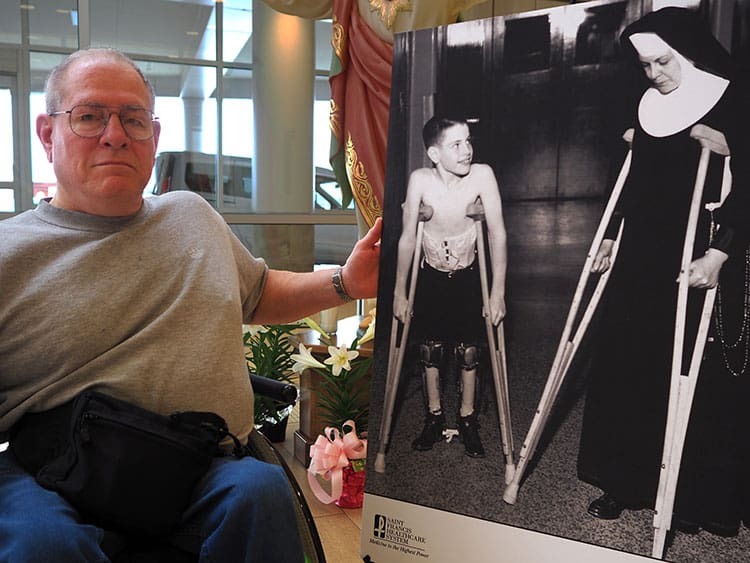 It started with my brother John, who was about 13 months older than I am, got polio in his one leg. Everyone assumes he gave it to me, but having done some reading recently about incubation periods and can be up to 35 days before symptoms appear, it’s entirely possible I gave it to him. But my brother wound up in the hospital, and my mom tried to get an old doctor, back when they still made house calls to examine me but for whatever reason, he refused. Several days later, we were going to visit. Of course, in those days, you dressed up in your best clothing so I was wearing shorts, a shirt, and a jacket. And my mom found me lying on the couch in the middle of the day. And now I understand the tone of voice and look in her eyes when she asked me what was I doing. Because at 4 years old, you don’t sit around much. you’re always moving. I told her my legs hurt. And it was panic. now I know she panicked. They took me to a different doctor who sent me to the old Saint Francis. I was diagnosed with polio and put in the hospital. I have vague flashes of memory. A lot of it has simply been erased by the fever and the illness. I remember various episodes, but there’s no sense of time. In that photo, I was probably 7, maybe 8. MAR: The picture, if you haven’t seen it, is Dave as a boy. He’s shirtless with his leg braces on, smiling at one of our sisters as they both walk on crutches. DF: It think it was a publicity photo for the march of Dimes and I was supposed to be explaining to the nun how to use crutches. I was quite expert by that time. MAR: It was funny, he said, because in reality, the sisters were the real experts. DF: I never had any doubts about the nuns. Because you couldn’t crack their faith with a ball-peen hammer. They ran the place. We had doctors and we had nurses, but there was no doubt who was in charge. I vaguely remember wondering what this nun was talking to this young, I don’t know if he was an intern or a doctor, but it vaguely reminded you of a drill instructor talking to a recruit. There’s no doubt they ran the place. They were in charge. The one principle was, the patients come first. What you have today, people talk about standing on the shoulders of giants. Well you’re standing on the shoulders of those nuns. They set the standards. Everything that’s going on now, they started it. They set the standard for what care ought to be at a hospital. And given the choice, I’ll always go to Saint Francis because of that. Things have changed radically. Especially in technology. I look at the things going on in this hospital, with electronics and MRI and all this and you can’t believe what’s going on now. But you can see it’s based on them. It’s based on the past. What went on with me in the 50s is what’s going on now, only in an increased and better manner. MAR: So this wasn’t exactly the episode we set out to make when we started. 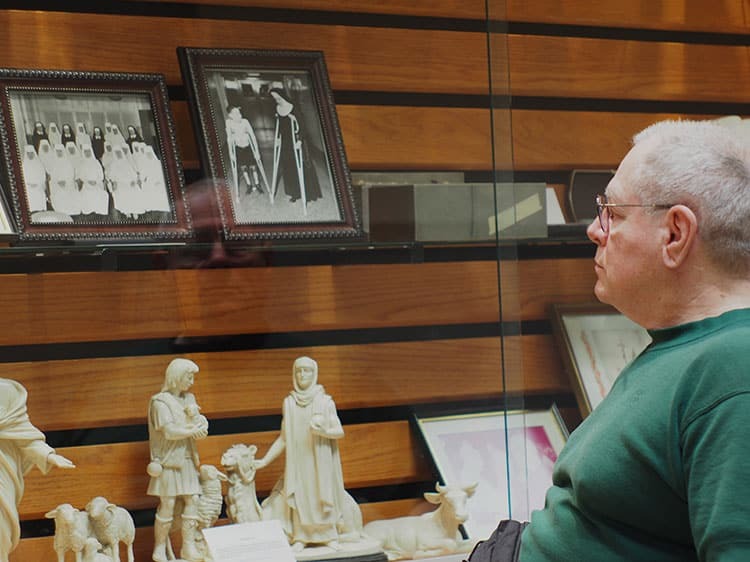 We didn’t expect to meet Dave or hear a first-hand account of life with the sisters. But it’s like the bishop said… sometimes that’s just the way God works. So thanks for joining us. If you like what you heard, tell someone. If you want to get a hold of us, send us an email to the bright ideas folder or message us through the sfmc.net/listen/ homepage. Until next time, I’m Maryann and adios.